Location: Southern Vermont/Manchester & Brattleboro. Time: Drivers Meeting is at 8:30 AM. We will be meeting at the Johnny Appleseed Welcome Center on Route 2, Westbound. Driver’s meeting is scheduled for 8:30 AM. From there we will travel up scenic roads and byways through Western, MA. to Southern Vermont. We will be stopping in Manchester, VT for lunch and shopping at the Manchester Designer Outlets. Planned stops for the trip may include the Vermont Maple Museum along the Molly Stark Byway, the Saxon Distillery for a Maple Whiskey sampling (great gifts), the Grafton Cheese Shop for an excellent Vermont cheese selection or the Bennington Museum. 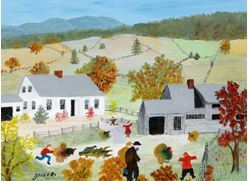 The Bennington Museum holds the largest public collection in the world of paintings by Grandma Moses, the great 20th-century folk artist who painted scenes of rural life embodying a sense of an idyllic bygone America. Our lodging for the evening is at the Comfort Inn and Suites, 1186 Putney Road, Brattleboro, VT 05301. We have a block of 10 double bed rooms, that will be held until April 4, 2019. The cost is $125.00 plus 10% taxes for a final cost of $137.50 for the night. Please call the hotel at (802) 579-1344 and identify yourself as a member of Mass Miata and you want to reserve one of the 10 rooms for May 4, 2019. FYI There is an indoor pool. They will need a credit card to hold the reservation.